The majority of the Antarctic continent is covered by permanent ice and snow leaving less than 1% available for colonisation by plants. Most of this ice and snow-free land is found along the Antarctic Peninsula, its associated islands and in coastal regions around the edge of the rest of the Antarctic continent. Even in the most inhospitable ice-free habitats, such as inland mountains and nunataks, life can still be found. There are no trees or shrubs, and only two species of flowering plants are found: Antarctic hair grass (Deschampsia antarctica) and Antarctic pearlwort (Colobanthus quitensis). These occur on the South Orkney Islands, the South Shetland Islands and along the western Antarctic Peninsula. 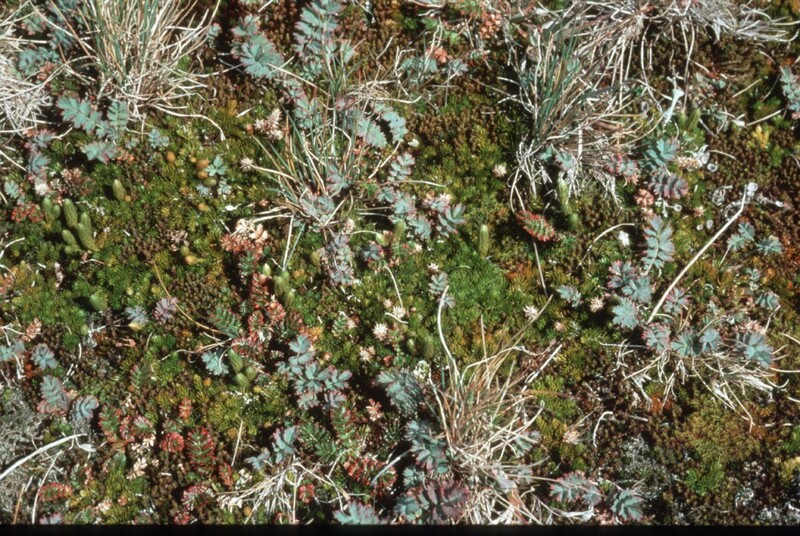 The vegetation is predominantly made up of lower plant groups (mosses, liverworts, lichens and fungi) that are specially adapted to surviving in extreme environments – in particular tolerating low temperatures and dehydration. There are around 100 species of mosses, 25 species of liverworts, 300 to 400 species of lichens and 20-odd species of macro-fungi. The greatest diversity of species is found along the western side of the Antarctic Peninsula where the climate is generally warmer and wetter than elsewhere in the Antarctic continent. 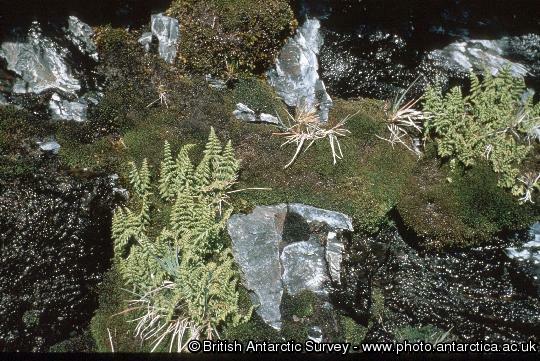 Certain species of moss and lichen, however, have a widespread distribution and others specialise in surviving in very extreme conditions. In the dry valleys of Victoria Land, for example, where it is very dry and extremely cold, algae, fungi and lichens are found living in cracks and pore spaces inside the sandstone and granite rocks. The subantarctic islands have a milder and wetter climate more favourable for plant growth, meaning these islands possess a more diverse flora including a greater number of flowering plant species and some ferns. 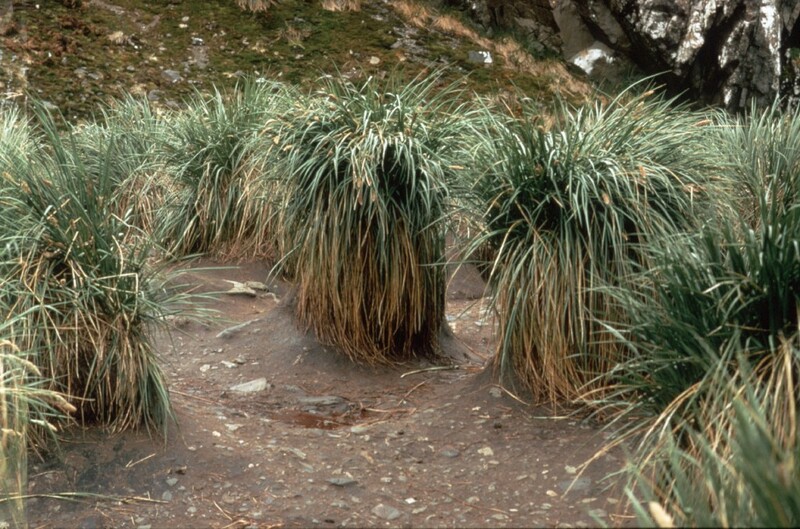 Dominant amongst subantarctic vegetation is tussock grass, a tall (up to 2 metres), robust plant forming a dense fringe near the coast. Wet habitats are covered by various kinds of bog, while drier terrain has extensive dry grassland with various herbs and, in exposed habitats, sparsely vegetated moss and lichen-dominated fellfield. Human activities such as whaling and sealing have led to many species being introduced. 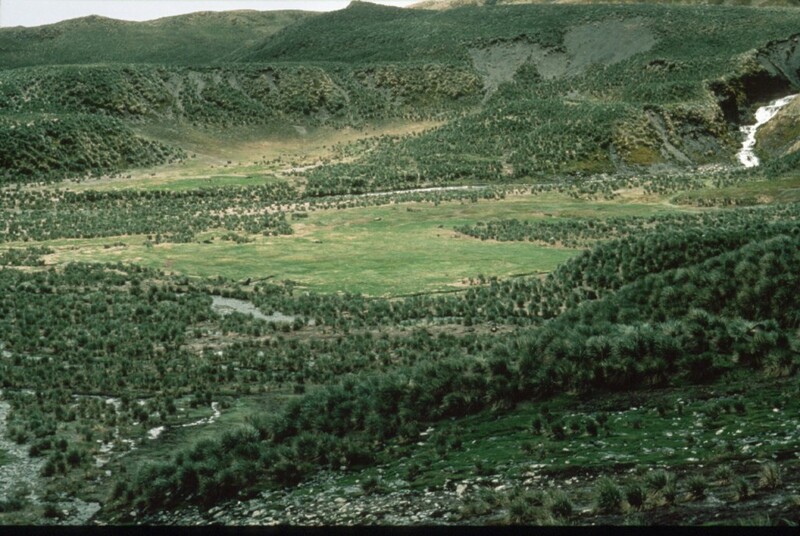 South Georgia, for example, has a vascular flora of 26 indigenous species, with a further 15 alien species that are well established, and in some cases spreading, and a number of other alien species which are managing to survive close to the former whaling stations. Only 12 flowering plants have been reported from Bird Island. The majority are easy to find, but not always easy to tell apart. 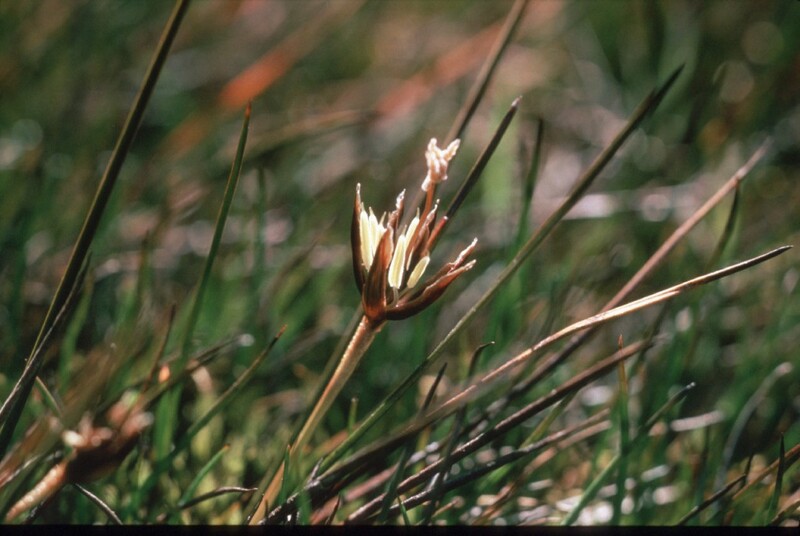 Only one specimen of annual meadow-grass has been seen, the fern is rare, small and well-hidden, and although blinks has obvious white flowers, it was not reported before 2006. The DAFOR scale of occurrence has been used to give some idea of frequency. Frequent in the meadows above the seal trampled areas. The leaves are grey-green and longer than wide. The flower heads are on erect stalks and about 1cm in diameter. Abundant. Smaller and greener than the above, and generally growing a little higher up. The leaves are about as long as they are wide. The flower heads are on prostrate stalks and about 5mm in diameter. The detail shows the contrast between the two species. Frequent. Magellanic clubmoss ( Lycopodium magellanicum ) amongst Acaena magellanica, A. tenera and Festuca contracta (grass). Erect spore-producing structure (strobili) prominent on clubmoss. The cross between the two species, which has the grey green colour of leaves of magellanica but the small flower heads, short stalks and leaf shape of tenera. Occasional where the two parents grow close together. Common in boggy areas and along stream banks. The flower is tiny and only has yellow stamens and anthers. Abundant. Light green cushion forming plant of drier areas. 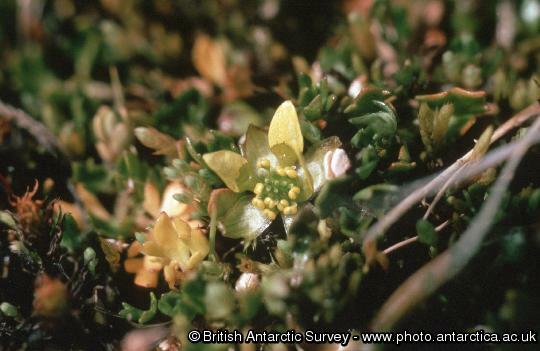 It is one of only two flowering plants found in Antarctica, however the flowers are tiny. Frequent. Found in the wetter areas, but again generally cushion forming. The leaves are slightly broader and the cushion firmer and slightly more spikey, but the best way to tell them apart is from the flowers. In C. quitensis they stick out from the cushion, but in C. sublatus they are inside it. Frequent. The grass that forms the lawn of the meadows. 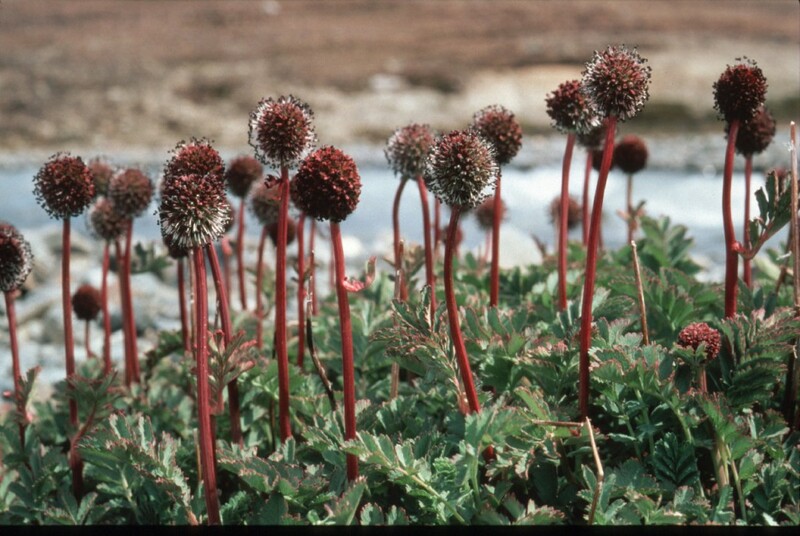 It is the other flowering plant found in Antarctica. Frequent. Grows in rocky crevices. Small (leaves around 5mm across, with a prominent vein) and difficult to find – I initially found a couple of plants growing on the rocky bluffs at the top of Wanderer Valley, on the east side, but later found a whole bank at the base of a rocky scarp in the same area. Rare. A new addition to the flora, first reported on 2006 February 18 by Jon Shanklin. Found at the eastern end of Molly Meadows, where it is well established in several patches, the largest some 100m2 in area, mostly in association with D. antarctica. Locally frequent. Another new addition to the flora, first reported on 2006 February 20 by Jon Shanklin. A single plant was found on the west side of North Valley, most likely carried to the island from the mainland of South Georgia by birds. Rare. The dominant plant of the lower slopes of the Island. Formerly known as Parodiochloa flabellata. Dominant. Common in the damper areas of meadows. The flowers (small and off yellow) seem to come out at a different time to the leaves. Frequent. Found in some of the meadows. Occasional. Many fungi, liverworts and mosses have been reported from Bird Island. The Ceph liverwort was found in some of the meadows in Wanderer Valley, just below Wanderer Ridge. It appears to favour the grass meadows. The stems are very thin, and the bifurcated leaf tips are brown, where the rest of the plant is green or colourless. It may be mixed in with other species. Marchantia is the most easily recognisable liverwort on the island. 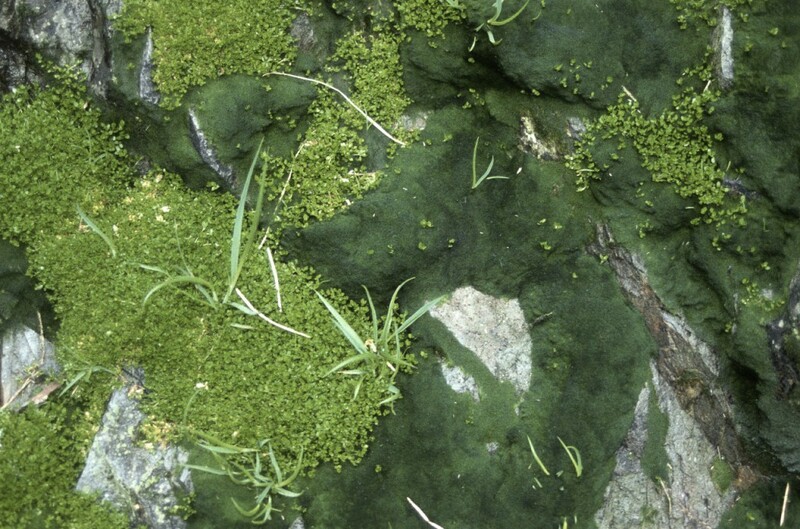 The large thallus is often visible on the peat banks of the lower parts of the streams. Dried specimens of most of the Antarctic and subantarctic flora can be found in the British Antarctic Survey’s herbarium.